Angkhola by makers of KHT has given this khukuri extra additional weight making it heavier for heavier task. 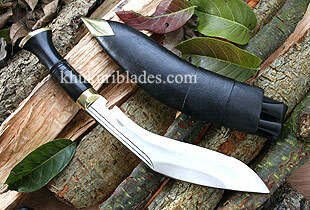 Angkhola khukuri by the makers of Khukuri House Thamel has given great emphasis on the extra weight to the kukri. The forging of the blade is done in such a way that a layer is visible at the top back part giving the blade the extra additional weight to perform heavy duty work with ease. The balance is such that even though it is heavier one can handle one for longer period of time. This kukri is especially designed for jungle task, hiking and chopping off bigger wooden logs, trees and fire woods. It is a typical working farmer's kukri.